This larger than average executive property has 6 bedrooms and 3 bathrooms and is ideally suited for the large family or those wishing to holiday together. 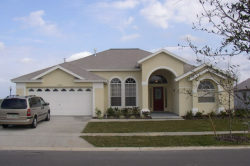 It is located within the quiet community of Orange Tree and is within easy reach of Disney, and other attractions as well as several excellent golf courses. The community is set amongst beautiful orange groves and has a children� playground, tennis courts, basket ball courts plus a soccer field! What makes this home special is the space and the style! - you have two living and dining areas and the �L� shaped plan offers easy access to the pool from three different points and a lanai which is ideal for relaxing in the shade or eating outside. 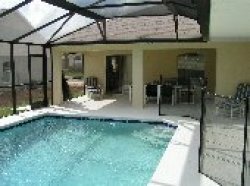 The screened pool is larger than average and has a good size spa for you to enjoy and relax . There is underwater lighting for night-time bathing. High quality patio furniture has been provided for your comfort. The pool area is fitted with a safety fence and all pool access doors are alarmed. 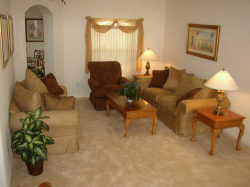 Inside, the family room has a 32� TV with Cable, Video DVD and CD Player. The second living area also has a sofa bed if you need extra. The fully fitted kitchen includes ceramic top cooker, microwave, dishwasher, fridge/freezer (with ice maker and water dispenser), coffee maker, blender and toaster. The separate laundry room is fully equipped with washer, dryer, iron & ironing board if you have the urge or choose to pack less.. There is a dining room for formal dining as well as a breakfast area (nook) next to the kitchen which overlooks and has access to the pool. 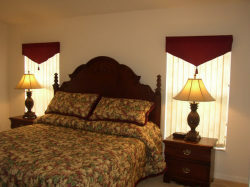 Our home has 6 bedrooms and 3 bathrooms which offers several combinations for who sleeps where. All bedrooms have a TV some VCR or DVD TV/DVD and a playstation2 is also available (check out the Mickey Mouse TV set). The Master suite has a King size bed and full en-suite facilities., roman bath and walk in shower. Beds 2 and 3 are served by a bathroom which is situated between the two and has bath with shower over, WC and sink.. Bed 4 has a double bed. while beds 5 and 6 are both twins. The third bathroom has a walk in shower, sink and toilet and also provides direct access to the pool area. Each bedroom has fitted wardrobes (closets) providing ample space for hanging your clothes. All bed linen and towels are provided and there are several hairdryers available. We also provide a cot, high chair and stroller at no extra charge to our guests. Our management company is situated just a few minutes away and will work with us to ensure everything possible is done to make your stay pleasant and enjoyable.